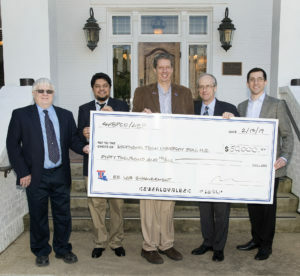 The American Electric Power Foundation has announced at $50,000 grant to the Louisiana Tech University Foundation for new equipment in the Power Systems and Smart Grid Laboratory. Pictured are (from left) Dr. Mickey Cox, Dr. Prashanna Bhattarai, Dr. Hisham Hegab, Malcolm Smoak, Devin Ferguson. The AEP Foundation is funded by American Electric Power and its utility operating units, including Southwestern Electric Power Co. (SWEPCO), which serves approximately 230,700 customers in Louisiana. Smoak is a past member of the Louisiana Tech Engineering and Science Foundation and serves as a member of the Louisiana Tech Electrical Engineering Advisory Board.